There's a joke here. 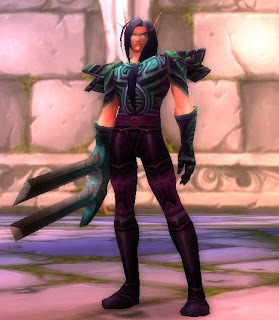 It's become a joke amongst my husband and me (and many others, I'm sure) that all blood elves are female. So... I gave my blood elf a distinctly feminine name and set out to find a feminine outfit. I was going to do it up pretty skimpy until I found the Symbolic chest on the AH. Had to have it. I figured tight-fitting and an open-back was good enough. After I found that chest piece on the AH, months later I have yet to see any other piece of Symbolic plate come up. Perhaps it's not high on the priority list of farm items for mog-sellers... or is it not popular? I can't believe that it wouldn't be popular. If it's not coming up on your AH either and you'd like the set - or some of it - head out to Dire Maul. East entrance. I clear out most of the instance when I feel like doing runs and pick up several greens, herbs, patterns and whatnots. Symbolic plate is a low drop rate... but I'm 4/9. Try your luck if you have some spare time. Nice! I really like the Talonguard shoulders with the Symbolic items and that sword. Thanks for the tip on where the Symbolic stuff drops, too. It does show up on my AH occasionally -- at huge prices -- but not as often as I think it should, either. Happy to help and hope you have good luck farming! 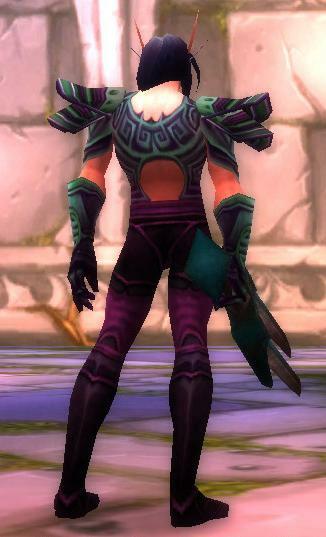 What are you plans for helm and shoulders since they aren't really matching the rest of the set? 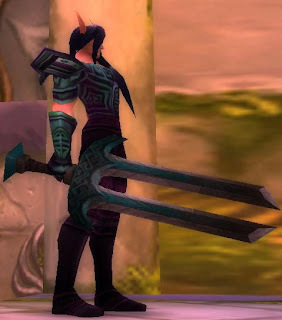 Nice weaponry choice for the set.